Ever on the lookout for opportunities for fun and adventure, Colleen (who is currently writing her own blog about those adventures I’m missing back in New York) heard that Future of the Left would be playing a show in their hometown of Cardiff while I was in the UK. Not only would it be an opportunity for me to see them play new material from their recently released album and two EPs, but it would be a good excuse to go somewhere new. 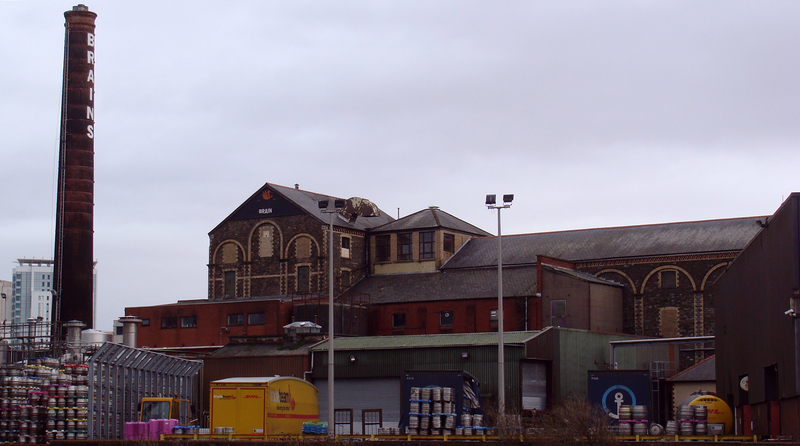 When I arrived in the afternoon, I headed along the River Taff towards Cardiff Bay, right past the largest brewery in Wales. Brains Brewery unfortunately does not host tours, so rather than making it my first stop I had to be content with merely admiring their towering smokestack. Incidentally, the blue shipping container behind the kegs and casks bears the logo of the company my father works for. As I walked to the bay, I had to fight wind anxiously rushing in from the water or out to it. The weather seemed unsettled, and the water whipped into choppy whitecaps. Gulls and cormorants flapped without making progress or glided first forward and then sideways. My legs acted similarly, being swept out ahead or off to the side of my intended step. I had to lean hard against gusts stronger than most storms I can recall. I had read that Mermaid Quay and the Millennium Centre were worth a look, but shopping and the usual tourist spots don’t typically appeal to me. Mermaid Quay looked like many built-up boardwalks I’ve seen in coastal towns before. I was headed for something unique to Cardiff: the Dr. Who Experience. 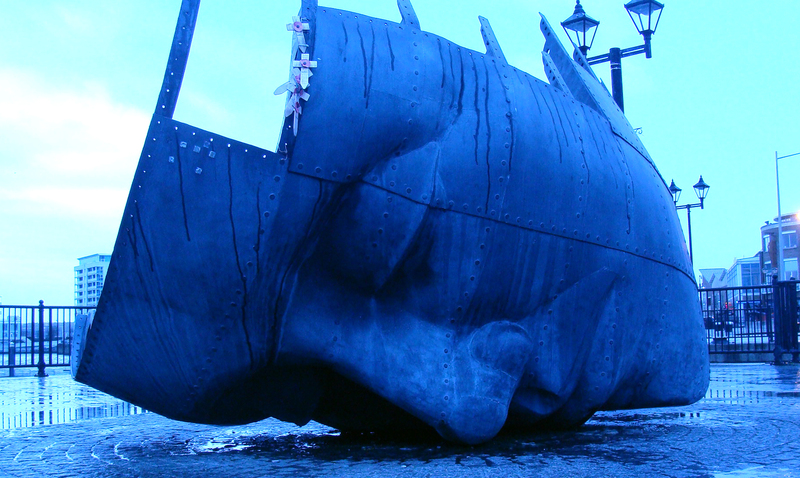 Since the series has been rebooted, it and its spinoff Torchwood have been filmed in Cardiff. 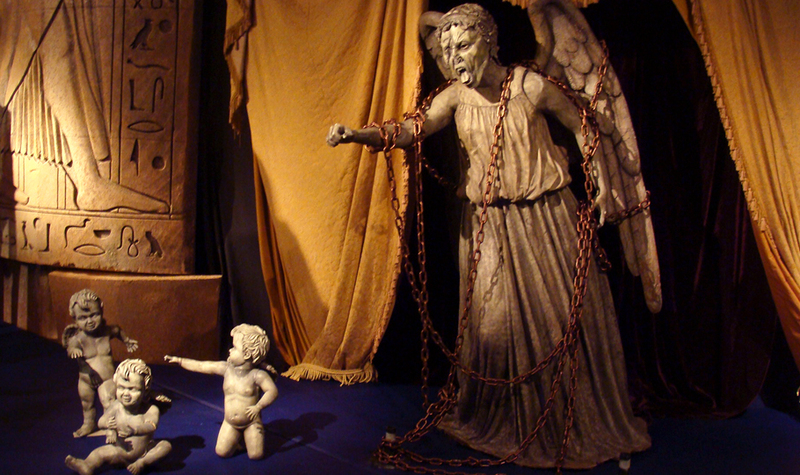 For the enjoyment of Whovians who make the pilgrimage, the BBC have put together an exhibit and something akin to a haunted house composed of Dr. Who paraphenalia. The experience locates you on the Starship UK when the Doctor (Matt Smith for those wondering which regeneration) guides you to the TARDIS in order to help him escape from the Pandorica II. You and your fellow Whovians pilot the TARDIS, but inadvertently land aboard a Dalek warship. It was all very campy, but great fun at the same time, much as you might expect. At the end of the story, you are released into an exhibition of costumes, replicas, fan art, magazine covers – virtually everywhere you could imagine the Doctor has appeared. 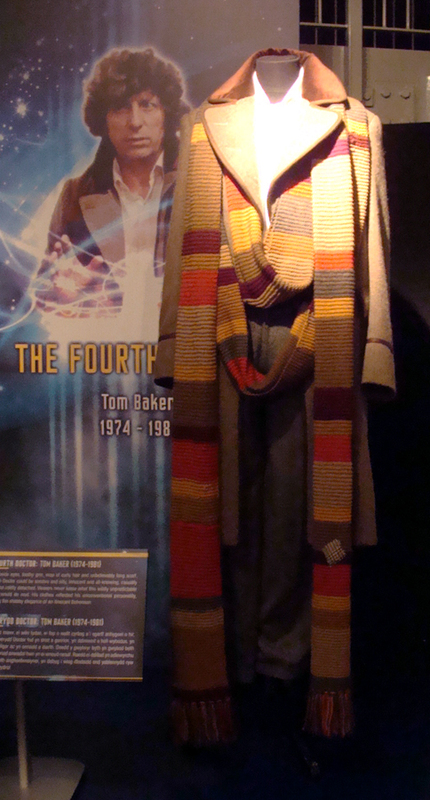 In addition to several generations of TARDISes (both interior and exterior) and a wide array of characters (both human and alien), the exhibit featured videos detailing some of the work that goes on behind the scenes. A particular favorite of mine was a small room dedicated to the sound artists who were responsible for the Dr. Who theme music and the iconic sound of the TARDIS (a slowed recording of a car key scraped along piano wire). The BBC credits itself as a pioneer of electronic music for its use of synthesizers and tape manipulation during the 1960s. All in all, there was hardly a moment that I wasn’t smiling during my time there. Skipping past some boring bits where I read a book in a pub while waiting to collect my key from the person who was hosting me in his flat, my next stop was Zerodegrees. While I’ve been enjoying quite a few cask offerings from breweries that have been around for quite awhile, I haven’t sampled much of the modern craft beers available in the UK. Zerodegrees seemed to be one of my first good opportunities, offering craft beer and pizza less than a block away from where I was to be seeing Future of the Left. Unfortunately Zerodegrees neither makes good beer nor good pizza. I started off with a half pint of their mango beer, hoping it would serve as an apéritif for a pizza and pale ale. However, it was cloyingly fruity, and a bother to get through even such a small volume. I didn’t finish it until I was half way through my pizza. The pizza was also very disappointing. It seemed like whoever came up with their pizza didn’t know if they wanted it to be thin crust, NY style, or Neapolitan style. It was too large to be a Neapolitan and seemed to use low moisture mozzarella, which would suggest NY style, but the cornicione was totally crushed as you might do if you’re making a crackery thin crust. No matter the type of pizza, they ladled on the sauce pretty heavy, and weren’t timid with the cheese either, which left the pizza wetter than most Neapolitan pizza I’ve had, despite having decent color on the underside. The crust had a thorough dusting of flour giving it an unappetizing flavor and texture, as well as preventing any browning or leoparding that might’ve otherwise occurred in their seemingly well-stoked oven (I couldn’t tell whether it was gas or wood from where I sat, but there were definitely visible flames). When the bartender finally came back around to retrieve my empty half-pint (the staff mostly seemed unaware or unconcerned with my presence), I asked for a taste of the pale ale. I decided to stick with water, and ended up leaving with a third of my pizza still on the bar. Future of the Left put on a terrific performance as always. Falco even seemed more jovial being in his hometown than in New York, smiling more often and going easier on the audience when talking between songs. That could just be in my imagination, though. Jimmy Watkins was as maniacal as ever, riding around on a friend’s back during a song or taping a Slim Jim to the headstock of his guitar and trying to entice audience members to eat it. However, I had some trouble really getting into the set. I often am easily distracted by particularly unruly members of the crowd at punk shows. A pit is to be expected, but there is still certain etiquette to be observed. One drunk guy was being very careless with flinging his body and flailing his arms, making a nuisance of himself to just about everyone in the front, even those who were otherwise enthusiastic about slam dancing. The stage was low and many times he would drive himself or be driven into the front row, who would subsequently fall over on stage or onto monitors. Eventually he fell into Jimmy, who shoved him away so that he could continue playing guitar. Jimmy’s friend, who had earlier given Jimmy a piggyback ride through the crowd, grabbed the drunken fellow and threw him back. The man collapsed at the feet of some audience members, who in a telling and unusual break with pit etiquette, made little attempt at helping him to his feet. The man appeared to be in pain, and made his way out of the room, though later returned smiling. Nevertheless, the violence just really pulled me out of the performance, and I had trouble enjoying anything else that followed. It’s difficult to parse out how to behave at punk shows, and many bands have struggled with finding a balance between allowing kids to have fun while also creating a space that’s safe enough for everyone to enjoy. There are bands that are important to me to who have made a special effort to find that balance or haven’t made that effort, and bands who have made that effort at some shows and not others. I don’t blame Future of the Left for what happened or for not intervening, as almost everyone in the crowd failed to do, but it made their show a lot more difficult to enjoy, and I hope that seeing that guy get thrown made as big an impression on them as it did me and makes them think about how things might’ve gone differently. NOTE: As you may have guessed, I took more pictures. I’ll eventually put them up on my Facebook if you’re interested. 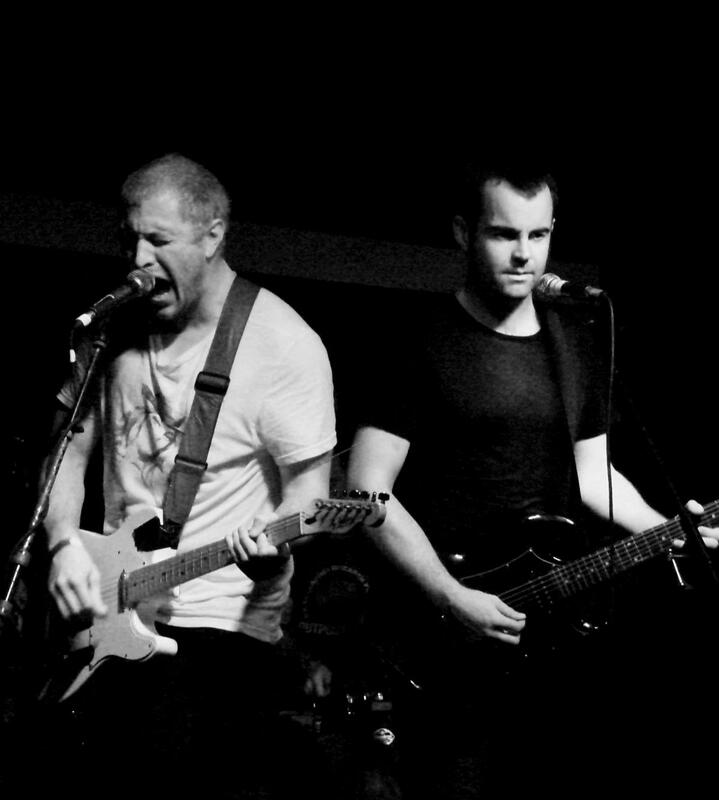 Also, for clarity’s sake, the pictures of the band are from a show (or two) that Colleen and I went to about a year and a half ago. Future of the Left’s frontman and drummer were formerly in mclusky, the band whose song appears at the top of this post. This entry was posted in beer, pizza, travel and tagged Brains, Cardiff, Doctor Who, Future of the Left, mclusky, narrative, Neapolitan, punk, Wales, Zerodegrees on February 9, 2014 by Dylan Bargteil. I really miss Mclusky, but at least we have FotL. They make different music, which I’m glad of. I don’t feel inclined to draw comparisons between them. I wish I could see mclusky play and I wish they still released records, but I don’t think I would give up FotL to have mclusky around, because I also enjoy seeing FotL and hearing their new material.